"I Wanna Be Down" is a song by American recording artist Brandy Norwood. It served as Norwood's debut single, the first from her self-titled debut album, released in 1994. Written by musicians Keith Crouch and Kipper Jones, with production helmed by the former, it was released on September 6, 1994 by the Atlantic Recording Corporation. The song is a mid-tempo track that features a thunderous beat and light synth riffs. Lyrically, "I Wanna Be Down" describes a flirt with a boy, who Norwood tries to convince of her charms. The song's music video was filmed by Keith Ward and released in October 1994. It features Norwood in her tomboy image, dancing in front of a jeep near a forest, flanked by several dancers. "I Wanna Be Down" was performed on several television and award show ceremonies, such as The Tonight Show with Jay Leno, the 1996 Soul Train Music Awards, and the 2014 BET Hip Hop Awards. It has been performed on almost every one of Norwood's concerts and tours, and is featured on the compilation album The Best of Brandy (2005). "I Wanna Be Down" was released to positive reaction by contemporary music critics. Its impact on the charts was comparatively large for a debut single: While it spent four weeks on top of the US Billboard Hot R&B Singles chart, it reached number six on the Billboard Hot 100, and the top 20 in Australia and New Zealand. In 1995, a hip hop remix with new vocals from American rappers MC Lyte, Queen Latifah, and Yo-Yo was released. "I Wanna Be Down" was written by Keith Crouch and Kipper Jones, while production and arrangement was also handled by the former for Human Rhythm Productions during 1993. Darryl Simmons served as executive producer, while mastering was overseen by Brian Gardner. Picked by Norwood's record company, Atlantic Records, as the leading single from her debut album, Norwood initially disliked the idea of releasing it as her first offering. "‘I Wanna Be Down’ was interesting", she said in a retrospective interview with Complex magazine in 2012. "I didn’t really get it at first, but I was young and I didn’t really know what worked at radio or what it was. I liked the song, but I just didn’t get it being the first thing that people heard from me." Upon its chart success she changed her mind on their decision however. "[...] Once it was released and I saw why everyone responded to the title phrase, I understood why!" The original clip for "I Wanna Be Down" was directed by Keith Ward and premiered prior to the single's official release in September 1994. The video portrays Brandy in her tomboy image, dancing in front of a jeep near a forest, flanked by several dancers. Her first video shooting, Norwood called the filming a great experience. “I was so excited about the video", she said. "I got a chance to work with some great people like Frank Gatson. All my friends were in the video. My brother was in the video [...] He was there and we had this little dance, and that became really popular. That was a fun time. I was so excited because my dream was coming through right before my eyes... at the age of 15". Rappers Queen Latifah (left) and MC Lyte along with Yo-Yo appeared on the official Human Rhythm Hip Hop Remix of "I Wanna Be Down". Upon its release, Atlantic Records head Sylvia Rhone came up with the idea of re-recording the track with a group of rappers. "I Wanna Be Down" was eventually remixed with new vocals from American rappers MC Lyte, Queen Latifah, and Yo-Yo. "The hip-hop remix meant the world to me", Norwood stated in 2012. "I'm fresh out of the box and these superstars are a part of my first single! They are my mentors and I looked up to them. I was a huge Queen Latifah fan. I'm thinking, 'Oh my God...I can't believe this is happening to me.' I got the chance to vibe with all three of them. They embraced me as a little sister. I was one of the first R&B artists to welcome hip-hop onto an R&B beat. It had never been done before quite like that[...] I knew it was a special record." A music video for the Human Rhythm Hip Hop Remix premiered in February 1995. It was filmed by director Hype Williams whose remix video for Craig Mack's 1994 song "Flava in Ya Ear" served as inspiration for the clip. A simple performance video, it features appearances by Lyte, Latifah, and Yo-Yo and was photographed "in glamorous black and white and vivacious color, complete with flashbulbs popping to the beat." Norwood's younger brother Ray J made a cameo appearance in the video. This version eventually earned Norwood her first nomination for a MTV Video Music Award for Best Rap Video at the 1995 ceremony. These are the formats and track listings of major single-releases of "I Wanna Be Down." Credits adapted from the liner notes of Brandy. ^ a b Josephs, Brian (2012-08-21). "Brandy Tells All: The Stories Behind Her Classic Records". Complex. Retrieved 2012-09-13. ^ Nathan, David; Rizik, Chris. "Brandy Biography". SoulTracks. Retrieved 2012-09-13. ^ a b "Full Clip: Brandy Breaks Down Her Entire Catalogue Feat. Babyface, Monica, Timbaland, Kanye West, Diddy & More". Vibe. Retrieved 2012-09-13. ^ a b c Leone, Lisa (1995-03-10). "Shoot Brandy". Vibe. Google Books. Retrieved 2012-09-17. ^ "Australian-charts.com – Brandy – I Wanna Be Down". ARIA Top 50 Singles. Retrieved 2011-05-23. ^ "Charts.nz – Brandy – I Wanna Be Down". Top 40 Singles. Retrieved 2011-05-23. ^ "Brandy: Artist Chart History". Official Charts Company. Retrieved 2011-05-23. ^ "Official Dance Singles Chart Top 40". Official Charts Company. Retrieved December 3,2017. ^ "Official R&B Singles Chart Top 40". Official Charts Company. Retrieved 2011-05-23. ^ "Brandy Chart History (Hot 100)". Billboard. Retrieved 2011-05-23. ^ "Brandy Chart History (Hot R&B/Hip-Hop Songs)". Billboard. Retrieved 2011-05-23. ^ "Brandy Chart History (Rhythmic)". Billboard. Retrieved November 30, 2017. ^ "Billboard Top 100 - 1994". Archived from the original on 2009-03-01. Retrieved 2010-08-27. ^ "1994 Year End Chart: R&B/Hip-Hop Songs". Billboard. Prometheus Global Media. Retrieved 2012-01-27. 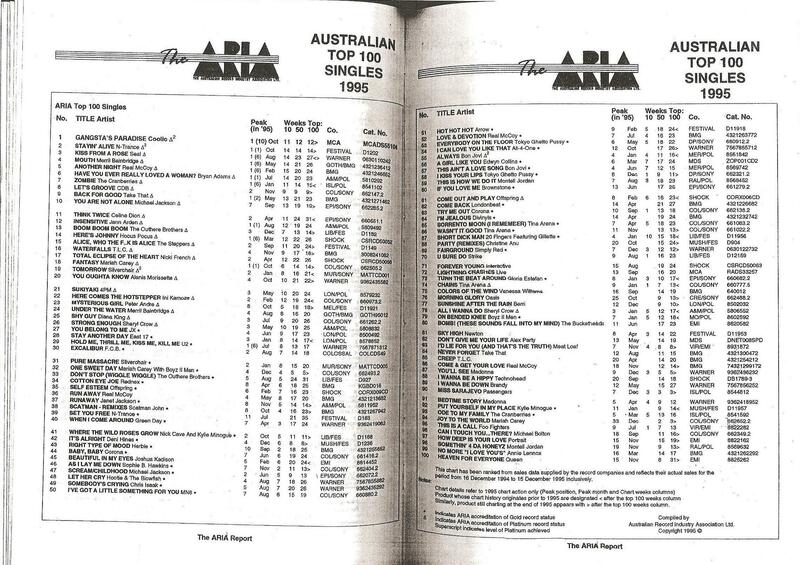 ^ "The ARIA Australian Top 100 Singles 1995". Imgur.com (original document published by ARIA). Retrieved 2017-08-04. ^ "Billboard Top 100 - 1995". Archived from the original on 2009-08-15. Retrieved 2010-08-27. ^ "1995 Year End Chart: R&B/Hip-Hop Songs". Billboard. Retrieved 2012-01-27. ^ "American single certifications – Brandy – I Wanna Be Down". Recording Industry Association of America. If necessary, click Advanced, then click Format, then select Single, then click SEARCH. "U Don't Know Me (Like U Used To)"
"Who Is She 2 U"